A truly disappointing, muddled and uninspiring adaptation of a classic. Stylistically confusing and not totally accessible. Who can ever forget the wonderful, sparkling, real and meaningful dialogue; the truthful and highly romantically charged chemistry between Hepburn and Peppard; the beautifully underscored tragi-comedy with music by Mancini; the brilliant directing of Blake Edwards? Well quite evidently Richard Greenberg can for one. For those old enough to have seen, loved and laughed their way through Edwards' film masterpiece, then this production will come as a huge and utter disappointment. If you haven't yet had the pleasure of watching the film, then you might, and mind you I say might, walk out of the theatre thinking that it wasn't bad, but I doubt anyone would come away glowing, having understood the storyline, and recommending it to their friends. To begin at the beginning. Due to some 'technical difficulty' the production was 10+ minutes late in starting. This did not bode well. Whatever the technical difficulty was, it certainly didn't appear to have been rectified as every scene change was late. Scenery being flown in and out, was slow, and actors were waiting for it in order to continue. We could hear the whirr of machinery as they descended too. We could see the set being moved into position in the wings prior to it coming on stage; we could see the leg and foot of a stage-hand behind the bar which ended up in a slightly different position each time it came on; we could see scenery wobble and slide as cast leant against it; we could see a fluorescent light used in two separate scenes flown in and then swing in the air; and on the second occasion come down too far and have to be hoisted back some during the dialogue; we could see these and more. We could also see that the lighting was never really quite right too. Strange shadows were created, and only partially lit faces at certain times. Spots didn't quite ever hit the mark, and never exactly on cue. The sound levels were set a little too quiet too. Audience members remarked on their way out that they had difficulty hearing some of the dialogue it was so low, and I am inclined to agree. As for the writing / adaptation, then I would need several reams of paper to try and rectify all the gross errors in this regard. The film was billed as a 'romantic comedy', and even that billing wasn't quite accurate; but it is probably about as close as you can get in two words. After having sat through last night's presentation those are the last two words I would think of using when describing what I witnessed. I am uncertain what 'genre' it would fit in, but it most certainly wasn't that. Those unfamiliar with the film or the plot would have wondered and probably still will be wondering why the production started with Holly singing part of Moon River staring through a window with junk food in her hands. No attempt was made to explain this... not even a sign 'Tiffany's', which might have gone part way to ameliorate this. There are so many incongruences and inconsistencies that I really don't want to write about them. Why all the name changes? That didn't make any sense. Why change the order in which the two protagonists meet? In the film he enters her apartment, meets the cat, and learns about her lifestyle and business arrangement with Tomato in Sing-Sing all in the same scene. In fact, the most important plot development - that of her business relationship with Tomato and his lawyer was grossly underplayed in last night's show. The 'other girl', who in the film is Paul's (Fred's) "decorator" Emily, but last night she became Holly's best friend Mag. However the worst plot change, for me at least, was the ending. Gosh, how wonderfully dramatic and romantic was the final scene of the film. Who can forget the cab stopping, Paul throwing the ring back at her and walking off in the pouring rain, her tears of remorse, regret, understanding and love, as she too runs out into the rain searching for and finding 'cat', and then seeing Paul still standing there simply loving her. They embrace and kiss as the music swells and the end titles roll. If you remember that, then last night's end was nothing short of a wet blanket and totally unfaithful to the film storyline. However, that was not even the worst of it. This play was semi-narrated, and the action was presented as a set of flashbacks. The narrator being Fred (who should have been called Paul - but we'll let that go for a moment), and breaking the fourth wall tells his side of the story to the audience and then the scene or partial scene is enacted. It is a wearisome device and rather than drawing us in on the action and making us feel more complicit with it, as it perhaps should have done; it separated us even more and disconnected us from the action and their situations. Deary me - now to the acting. 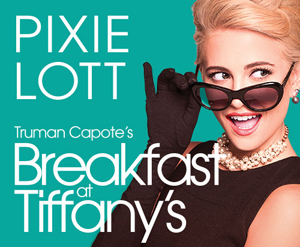 First of all there has been an awful lot of hype about Pixie Lott performing Holly Golightly (one of the few names that remained constant). I do believe she invested a lot in her character and performance, and as such she should be credited for that. Sadly it was way off beam. Her ever-changing accent which went through every single US state and some other places too was simply unbearable, and her constantly whining voice with lack of emotion, and constant lack of direction (either as a character or actually) was infuriating. She certainly was statuesque and did look the part, that much I can say, and she can sing. Her rendition of Moon River was competent. Why on earth we had to have 'People Will Say We're In Love' from 'Oklahoma' stuck in there for no reason, I really have no idea. Matt Barber as Fred again looked right, suave and dashing, but having to cope with the ever-switching from narrator to character in the action, obviously weakened his characterisation and this half-way house didn't really impress. The apartment block was rented by a crazy roller-skating liar, Mme. Spanella, played by Melanie La Barrie, who, as far as both plot development and adding to the whole were concerned, was totally unnecessary. Jose, played by Charlie De Milo, sounded and looked Indian on his first entrance, and so it was a surprise to learn he was Brazilian! There were two actors last night though, who, despite everything so obviously falling apart around them, did give very real and touching portrayals and their characterisations were truthful and enjoyable. One must always give praise where praise is due. Victor McGuire as the bartender Joe, and Robert Calvert as husband to Holly, Doc, were both excellently portrayed. I was able to sympathise with both, and somehow they managed to stop me, and perhaps others too, from walking! One really would have thought that using Truman Capote's writing, and being produced by Leicester's Curve Theatre with their artistic director Nikolai Foster directing, that this would have truly been not just a Lowry highlight but a national theatrical highlight too as it continues on tour before transferring to London. Oh well, can't win 'em all I guess!